The twelve volunteers are split up into three groups of four, and each group spends 6 days doing the same duties before having a day off, then changing to something different. On my first and fourth working weeks I was assigned to the ‘indoor nursery’. 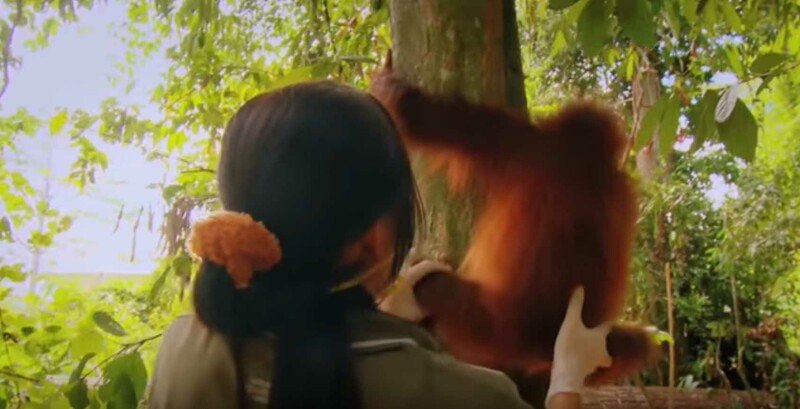 The word ‘indoor’ actually only means that the public don’t get to see these Orang Utans, not that they spend all their time indoors, so we are in a very privileged position. Our day starts with donning face mask and gloves and preparing milk and food for them. 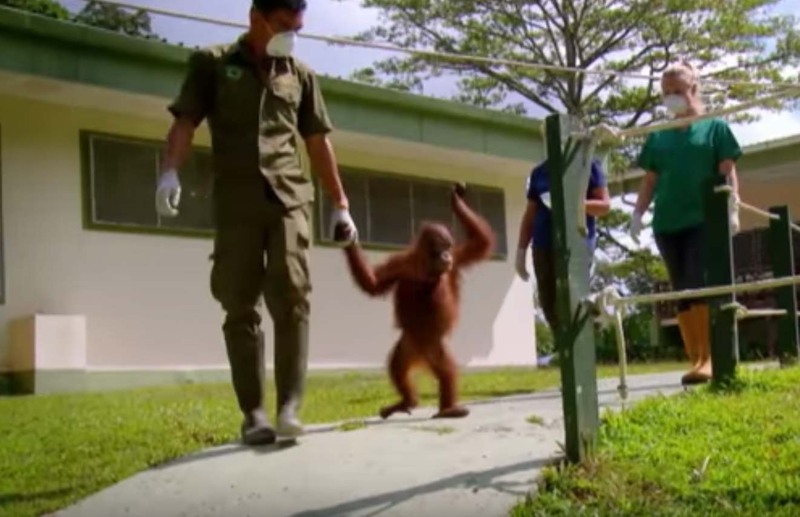 Most of the photos below are taken from the website or screenshots from a TV series ‘Meet the OrangUtans’, as we’re not allowed to take cameras behind the scenes. Two of the photos below are quite old, before the requirement for masks and gloves. Preparing their food can get a little complicated as there are 9 OUs of different ages and they sometimes have different requirements each day, depending on whether they have diarrhoea or not. Unfortunately this happens a lot, and if they are unwell we don’t give them any fruit, just vegetables. The little ones have really sensitive tummies and when they come down onto the ground they pick up all sorts of things that they normally would not be exposed to. If they were in the wild they would stay up in the trees with their mothers. Each time we handle an OU with diarrhoea or clean the enclosures, we wash our gloved hands with disinfectant. Some of them throw a tantrum if they don’t get their milk or food immediately, and with four volunteers and 9 OUs there are daily screaming hissy fits! Once a week they are weighed to ensure that they are putting on weight, and every so often they have a full checkup by the resident Vet. To weigh them we sit them in a basket on a really old and hefty set of scales and for the checkup they sit or lie on a metal table just outside. After they’ve been fed and checked, we transfer them from their individual overnight enclosures to a large outdoor play enclosure. This has ropes and raised platforms inside, and another group of volunteers will have put a huge supply of banana or ginger leaves inside for them to eat, shred, and generally make a mess of! 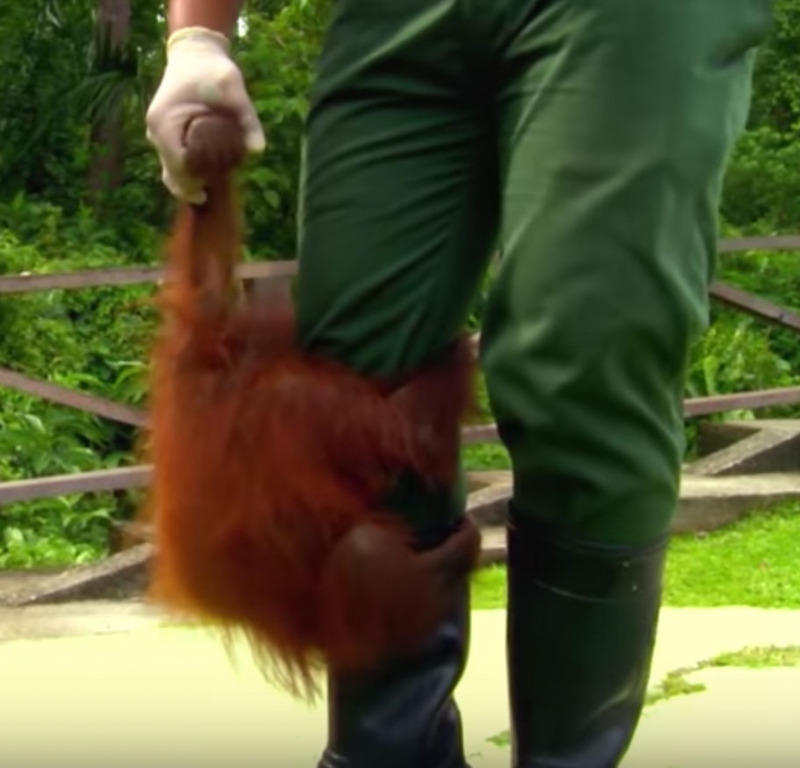 They are supposed to walk there holding our hands, but a few of them immediately cling onto a leg, sitting on a foot, and sometimes no amount of telling them “Jalan” (walk) makes a difference. Having an OU wrapped around your leg whilst trying to walk is rather sweet, but it makes for slow and awkward progress! Whilst they are happily playing outside, our next task is to thoroughly clean their overnight enclosures. Any remaining food is picked up, swept up and discarded. Any solid poo in their enclosure is picked up and hosed down the drain. The enclosures, walls and floor are hosed down, and we then clean every single bar of their enclosures with disinfectant. 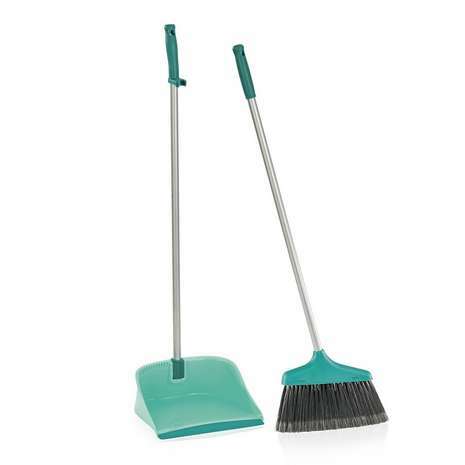 Once the place is thoroughly clean, one of us dons a ‘ghostbusters’ backpack and sprays the whole area again with disinfectant, and we can then take the OUs out into the forest. We walk them to a rope, hoist them up onto it, and push them away if they are reluctant to go. 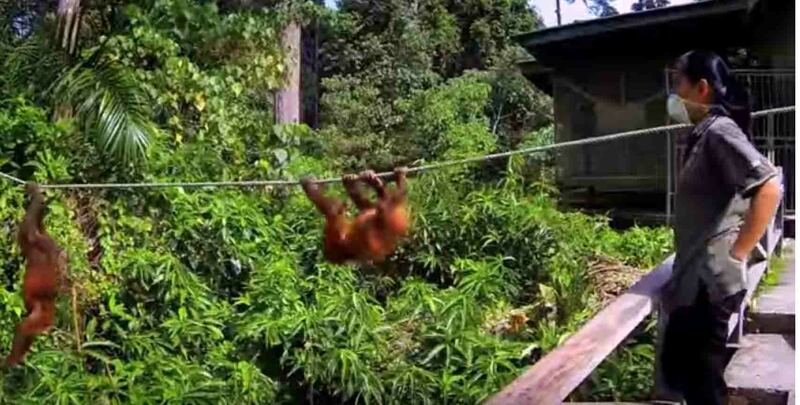 If they all cooperate, the scene is gorgeous – a ‘washing line’ full of young OrangUtans just hanging there as if they are pegged up. We then supervise them to try to ensure they stay up on their ropes and in the trees, and shove them back up when they come down. (more in my OrangUtan antics post). After an hour or so it’s time to return them to their play enclosure, and give them ice ‘lollies’. These are made in large yoghurt pots and contain an orange flavoured rehydration sachet, together with small chopped pieces of banana, watermelon, green beans, papaya etc. After lunch we prepare their afternoon milk and food, and then take them out again to play. There is an older OU called Nonong who is housed with the younger ones. She will be 15 this year, but when she was young she contracted malaria which led to a stroke, and it left her with brain damage, a paralysed arm and part of one side of her body, so she can never be released or climb in the jungle. She has social interaction with the young ones, but when we take them out after lunch for their jungle time, she takes herself back to her overnight enclosure for a sleep. We feel very sorry for her as she’s mostly a very placid soul unless she’s bullied by Sepilok, and then she quite understandably looses her temper and a fight ensues. On one such occasion Sepilok had been taunting her and she retaliated. Sepilok however grabbed hold of Tombi, the smallest, and used him as a shield, meaning that Nonong was attacking Tombi. The screams were horrible to witness – she was biting and pummelling him, and he couldn’t get away. Sepilok meanwhile had escaped unscathed, and quite often we refer to him as the little s**t! Just before 4.00 p.m. we start heading back, calling ‘Mari Mari’, which means ‘come, come’. They follow us on the ropes as they don’t want to be left alone out there, and when they arrive back at the ‘starting point’ we hold out a hand to them and they grab hold of it and let go of the rope. We walk them into their overnight enclosures, they have a drink and food, and that’s our duties done for the day. Archie sucking his thumb or big toe when needing comfort. Arriving for work to find Ospie lying on her back with her mat over the top of her like a duvet. Tombi and Selamat with their arms wrapped around each other during a thunderstorm. 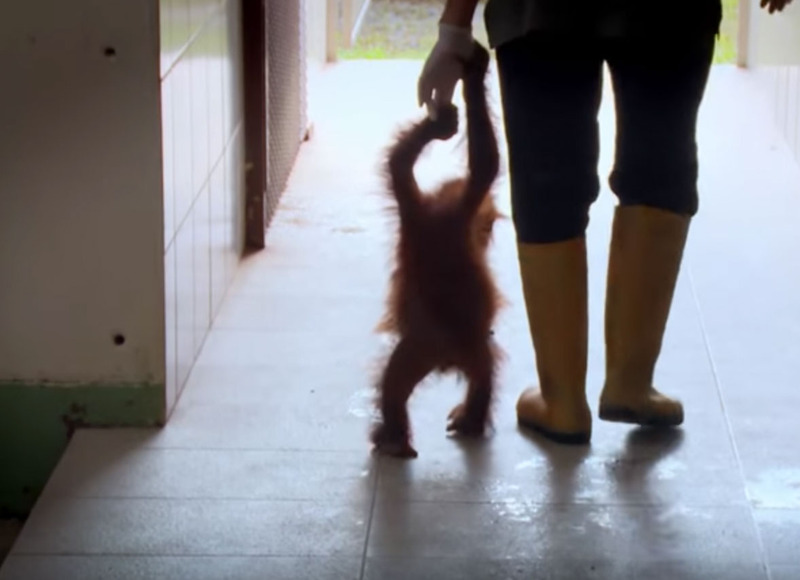 Tombi needing to have his hands held, and screaming when you let go and walk away. Tombi sitting on my foot and wrapping his arms around my leg instead of walking. Tombi crossing his arms in a huff the moment he’s put inside. Being watched by an OU who is lying on the roof. Koko throwing herself around and beating the walls if she’s not fed immediately. Koko climbing up a thick vine that went up over 100 feet, sitting on a branch too scared to come back down, eventually getting back on the vine but climbing higher until she was at the top of a tree. Giving the volunteers and a dozen rangers palpitations for about an hour until she finally plucked up courage to come down. Hearing the sounds of the Pygmy elephants trumpeting and being convinced that this is where they recorded the sound effects for Jurassic Park. Finding Wilma sitting outside the kitchen with a discarded sack on her head! Boogie Boy loving the newly accessible vines and spending hours lazily swinging on them.